How Can Paralegals Survive and Thrive in New Work Situations? How Can Paralegals Survive and Thrive in New Wokr Situations? Whether you’re new to the profession or you have years of experience as a paralegal, you may find yourself working in an unfamiliar practice area. You may be ‘learning by fire’ and not feeling confident about how you’re getting the job done. You may not have enough contact with your supervising attorney or feel like you’re bothering him/her with constant questions. Even if you’re not working in a new practice area, there are always new rules and procedures that you need to figure out. Just like the cable company, adopt the habit of ‘bundling.’ Try saving all the questions you need to ask the attorney and present them all at once. It’s tough to flag down a busy person and they don’t like frequent interruptions that take them away from their work. If you can schedule one or two fifteen minute meetings (say, first thing in the morning and perhaps immediately after lunch), you may find a more willing listener. Be sure you are getting the supervision that is required for nonlawyer staff. Remember that the attorney is to review your work before it leaves the office and that nonlawyers cannot sign pleadings or correspondence that offers legal advice. Familiarize yourself with the court rules for your state and your local jurisdiction. Know where to find requirements and time frames for any filings you’ll be doing. It’s your responsibility to know this for calendaring and for planning when work needs to be done. Are there similar older or closed files you can follow? They would give you great ideas for a procedure that’s been followed in the past, documents that have been drafted, and correspondence that’s been sent. Be sure to ask the attorney if there is another file you can follow or another client with similar issues. Make the court staff your new best friends. They are usually happy to help with the procedure and they may have checklists and forms you can use. Be sure to treat them with respect and be lavish with your thanks. Create your own procedures manual. This should include forms, checklists, contact lists, and helpful Web sites. The more systems you can put in place, the smoother your transition into this new practice area will be. Seek out continuing education opportunities, especially in the new practice area. You should consider certification and advanced certification. There are also a number of online courses (remember that The Paralegal Mentor offers a few that might work) that should be convenient for you to attend. Take an active role in paralegal forums. Two good ones are provided by Paralegal Gateway and by Legal Assistant Today. NALA also provides a good forum for members. The paralegals who post on those venues are very generous with their expertise and advice. They will generally share forms and their knowledge of procedure. Join local, state and national professional associations. After you’ve joined, become an involved member: go to meetings, run for office, join in discussions and educational events. This will provide chances for networking with other paralegals who do the same work you do. Professional newsletters and journals offer lots of articles that may help you with your situation. Find a mentor. Ask someone who has experience in the practice area to help you learn the ropes. Again, most paralegals are incredibly generous with their time and their expertise. Use social media as a resource. Establish accounts on LinkedIn, Facebook, and Twitter, provide a professional profile and dive in. Be sure to join whatever groups work for you, too. This is a great way to ask questions, locate resources and learn about educational opportunities. Just remember that whatever you post on these sites can be viewed by everyone so keep everything you do on a professional level. Your challenge: When you catch yourself saying, “Holy Moly…what do I do now?” take a step back, analyze the situation, and decide which of the above tips will work for you. You will probably find more than one. Then, step by step, learn all about the new practice area or the new procedure. Before you know it, you’ll be offering tips and advice to other paralegals. Mindfulness practices have known therapeutic benefits that I’ve seen firsthand as a lawyer and practicing yoga instructor. When I talk with lawyers about having a daily practice of mindfulness, meditation or yoga, there’s often resistance to add yet another activity to their already hectic schedules. But these practices have known therapeutic benefits that I’ve seen firsthand as a lawyer and practicing yoga instructor. Studies show that meditation leads to growth in areas of the brain important for learning, memory, emotional regulation, perspective taking and compassion. Simply put, it’s worth the time. Start small. Pick a short meditation you’ll be able to complete regularly. There are many types of meditation but, at its core, meditation is the act of concentrating your mind on one point of focus. Value the quality of the time and the number of days you practice rather than the amount of time you spend practicing on any one given day. A great starting point is a focused breathing meditation. Start by sitting or lying down. If you are sitting, be sure your feet are flat on the ground with your legs uncrossed. Your hands can be in a comfortable position with your arms unfolded. Close your eyes and take a deep breath in while slowly counting to three. The goal is to time your breath so that you have inhaled as much as possible as you reach the number three. Then exhale while counting to three. Again, the goal is to have exhaled as much as possible as you reach the number three. Repeat this for as many breaths as you’d like. If your mind wanders at any time, gently bring your focus back and start where you left off. Another option is a body scan meditation. You can hear a session I led with the Live & Law in LA podcast. Attach your practice to something you already do and/or schedule it. The best way to be consistent is to build a short practice around your current activities. For example, doing the above breathing meditation for five breaths before getting out of the car when you arrive at the office and/or before getting out of the car when you arrive home. Another alternative is to turn something you do daily into a mindfulness exercise. Mindfulness is the act of observing one’s physical, mental and emotional states in the current moment without judgment. For example, if I mindfully brush my teeth, I slow down the activity and focus on the feel of the brush on my teeth or the taste of the toothpaste without deciding if I like or dislike it. Track your progress and commit to being consistent. In order to get the most from your practice, it’s important to be consistent with some form of practice. Studies that focus on changes to the brain in connection with mindfulness, yoga and meditation, all show these benefits take place when the exercises are done consistently. Put time on your calendar or use an app to track your consistency. If client demands or other personal needs come up, that’s okay, but reschedule your practice time in the same day rather than cancelling altogether. If you miss a day or two, it’s okay, just pick it up the next day. This isn’t about being perfect every day—just completing your practice most days. Grow your practice slowly over time. When you first start out with your new practice, put a reminder in your schedule every week or two to check-in and determine if it’s time to increase your practice time. For example, if you started with five focused breaths before getting out of the car when you arrived at the office, try ten breaths after a week’s time. After another week, try 15. When the number gets too high to count easily, try moving to a timed meditation by setting an alarm for three to five minutes. Then each week increase your time by 15 to 30 seconds until you reach your desired length. Be forgiving and patient with yourself and your practice. Lawyers are often perfectionistic and whatever we do, we want to be the best. As a result, we can be incredibly critical of our performance. When I first started my daily meditation practice, it felt like I was failing because I found it difficult to get it in every day. My yoga teacher suggested I try changing the time of day I meditated, but, more importantly, that I go easy on myself. Give yourself the same permission to be a beginner and investigate different options. The end goal is to create a consistent practice that works best for you. 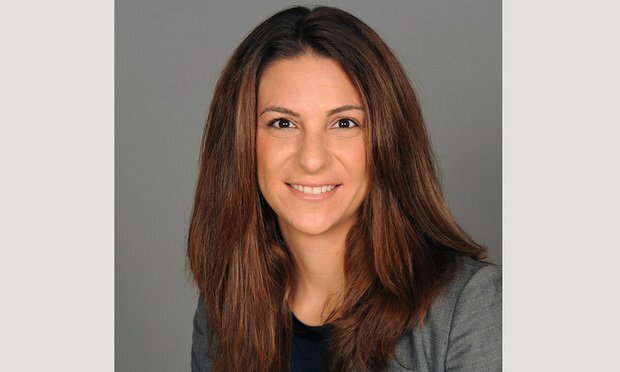 Jennifer Cormano is an associate in Nixon Peabody’s Los Angeles office. She represents both nonprofit and for-profit health care providers, including hospitals, physician groups, academic medical centers, surgery centers, accountable care organizations, and other organizations affiliated with the health care industry. Her practice focuses on hospital/physician alignment strategies, corporate governance and formation matters, joint ventures, mergers, acquisitions and other strategic transactions. The information outlined above does not constitute legal advice and is meant solely for educational purposes. Edit a PDF in Microsoft Word https://bit.ly/2CPAsPN < Want to convert a PDF to Word? No special software needed! Looking to improve your health in 2019? Breaking down your goals into smaller SMART goals can be the difference between aspirations and realizations. SMART goals are Specific, Measurable, Attainable, Realistic and Timely. Adopting behaviors in this manner helps to create lasting lifestyle changes! Think about the goals you have for your health and the positive results you hope to achieve in 2019. Integrate some of the suggested SMART goals below that can help you reach those results. Pack a healthy lunch for work three days each week. Walk for 15 minutes of your lunch break five days each week. Designate two evenings each week to be screen-free time. Aim to go to bed at a time that allows you to sleep for 8 hours five days per week. Add an extra serving of fruits or vegetables every day. Drink a glass of water before each meal, three days a week. Strive to avoid added sugars in foods two days each week. Select 5 days each week to perform at least 30 minutes of exercise. Stay ahead of stress by allocating five minutes every day for a stress-relieving activity such as a brisk walk, quick meditation or deep breathing exercises. Make one new healthy recipe for dinner every week. Aim to get 10,000 steps five days each week. Start your day in a healthy way by eating a nutritious breakfast at least three days a week. Meditate for 10 minutes before work two days a week. Strive to eat a dark leafy green vegetable such as spinach, broccoli, kale, romaine, etc., three days each week. Include two days of resistance or strength building exercises each week. Use a fitness device or app to track your workouts daily. Add one serving of whole grains such as brown rice, quinoa, whole grain bread, oatmeal, etc. three days each week. Select one day a week to eat vegetarian. Choose two days a week to spend one hour doing something you love such as reading, a hobby, journaling, or any other activity you do for personal enjoyment. Create your own SMART goals! When setting wellness goals, creating specific goals to achieve over a designated period of time is the best method to successfully achieve lasting lifestyle changes. Eating healthy. Cardiovascular activity. Stopping the next episode from auto-playing. We all have our struggles. We know how we should act, but the actions don’t always follow. Personal branding is an all-too-perfect candidate for this category. We’ve generally accepted that a strong personal brand is important. But carving out (and protecting) time to actively brand ourselves? That’s a whole other matter. The good news is, even if you don’t consider yourself a social media darling, you can create a professional brand that impresses all who view it, and you can do it in just a few minutes a month. Previously, we wrote about free ways to build your personal brand on LinkedIn. 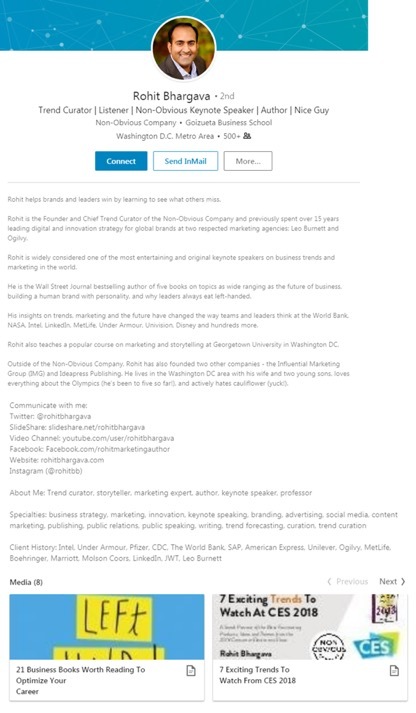 In this post, we illustrate how to optimize your LinkedIn profile using examples from marketers who made us take notice. To make it easy for searchers to pick you out from the pack, we recommend writing a profile headline that’s instantly recognizable. There are several "Jason Falls" with LinkedIn profiles. Here, Jason Falls, the marketer, cleverly uses his headline to clearly distinguish himself. Just how important is it to distinguish yourself? The LinkedIn community is strong at over 546 million users. 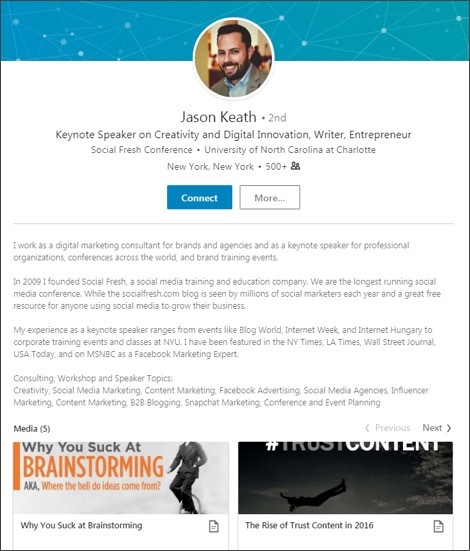 By making incremental updates to your profile, you can greatly increase your visibility on LinkedIn, and there’s no better place to start than with your headline. Shoot for a headline that sums up your specialty or approach succinctly and supports the professional brand you’re cultivating. Take time to review and update your profile regularly, because the search for people like you is a never-ending one. A complete, up-to-date, engaging profile tells the professional world you’re open for business. Use the examples below as inspiration for spiffing up your own LinkedIn profile. Who nailed their LinkedIn profile headline? If the headline is your salutation, then the summary is your media-enhanced elevator pitch. What do you really want readers to know about you, if they read nothing more? Professionally speaking, what’s your purpose? Think along these lines when you craft your profile summary. Your commitment to incremental improvement and professional growth is as impressive as it is inspiring, so don’t hesitate to let others know about it. Your profile summary could be a perfect spot to convey your career goals. You can highlight your skills as well as developing aspirations to leave a reader feeling good about your interest in self-improvement and growth. When writing your summary, try to strike a conversational tone that invites the reader in. Because you want to get this just right, consider drafting two options you’re happy with, then ask a trusted peer or mentor for their feedback. Who nailed their LinkedIn profile summary? 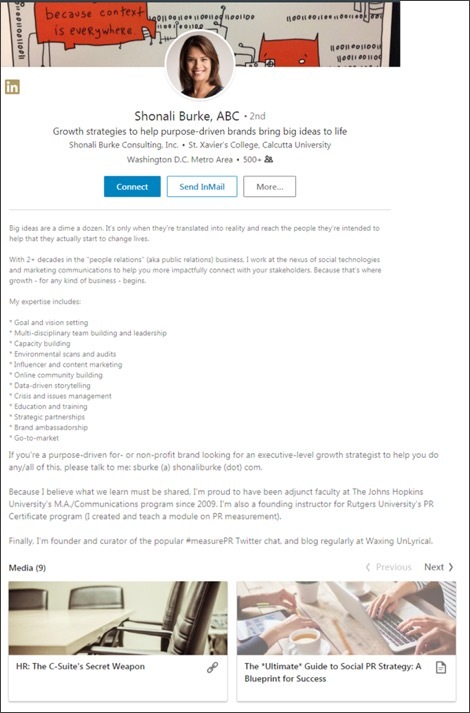 Linkedin makes it easy to show professional proof benefitting your personal brand right from your profile. 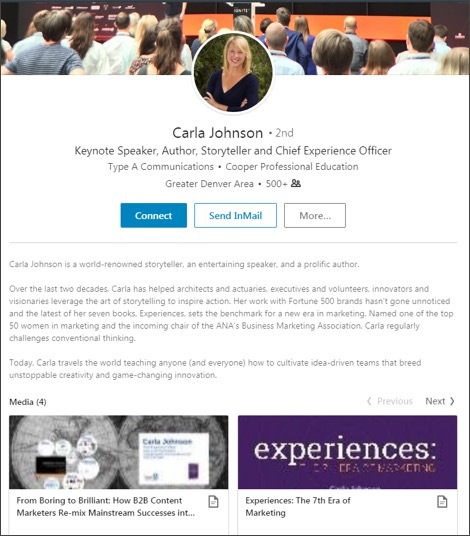 Rich media including presentations you’ve authored, videos you’ve helped create, web pages you’ve written, campaigns you’ve designed and more can be added to your profile summary, as well as within each section of your work history. 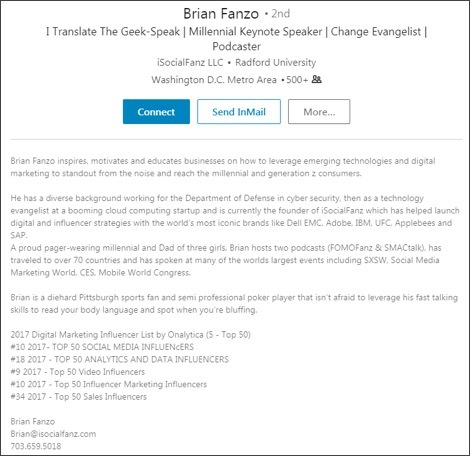 When adding rich media or links to your profile, take a moment to include a title and description to help set the stage for the viewer. 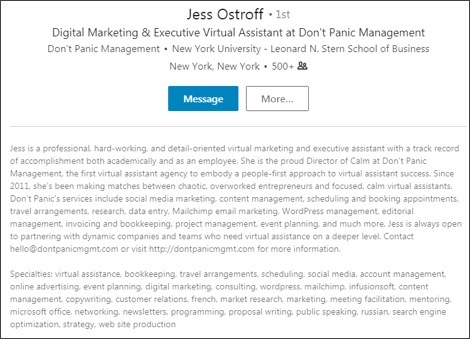 There’s more than one way to create a unique, polished LinkedIn profile. Thirty minutes per week is all you need – no struggle necessary. Hopefully these examples have inspired you to make incremental strides toward your own standout profile. 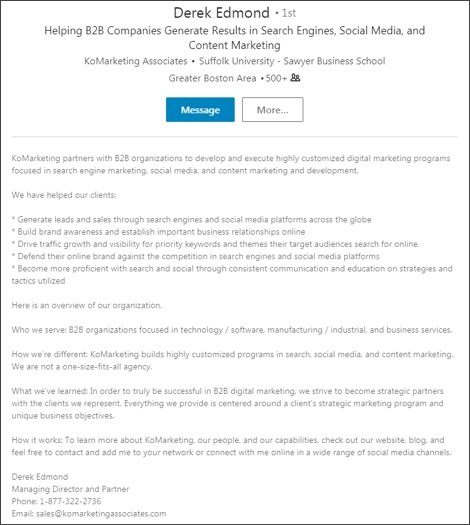 Subscribe to the LinkedIn Marketing Solutions blog to learn more ways to advance your marketing career. The value of the more soft-spoken members of the C-suite is becoming widely recognized and – based on the results these leaders have quietly achieved – it’s fair to say that it’s about time. However, without years of past effectiveness to point to, introverts who are new on the job need to prove their value. We’ve spoken to a number of self-identified introverts to find out how they have capitalized on their strengths and overcome their weaknesses in order to show their new employers just how valuable they can be. When you start your first job, you are not expected to know everything, but you are expected to learn. Use the introverted tendency to be an observer to your advantage and absorb as much information as possible – particularly in your first month. Later on, use all of your new-found knowledge to make informed and productive contributions to discussions and your new company as a whole. When working as a part of a team, introverts and their hard work tend to get lost in the noise. Although acknowledging the value of your team members is important, it is equally important to take pride in your achievements and to not shy away from credit. Rather than seeming obnoxious, the introvert who remembers to say ‘I’ now and then clarifies not only their role on the team, but their value to their employer. “Introvert” is not a synonym for “snob” or “standoffish,” and you can make that clear to your new co-workers by capitalizing on opportunities to interact with them one-on-one. Build your in-office network and connect with your team by connecting first with individuals. Things as simple as asking a question face-to-face rather than sending an e-mail or eating lunch in a shared space rather than at your desk can go a long way in building relationships – without forcing you too far out of your comfort zone. Unlike their extroverted counterparts, introverts tend to be uncomfortable with public speaking, particularly when they are put on the spot, and this can make it difficult to communicate in team meetings. To overcome this natural anxiety and make it easier to share your ideas, ask for the topics that will be discussed in a meeting in advance whenever possible, and familiarize yourself with your talking points beforehand. As a bonus, preparing for meetings shows initiative, a quality most employers look for in their new hires. Although group work is an increasingly prevalent part of any work day, your first job will almost certainly offer you the opportunity to work independently. This can be the introvert’s time to shine, so take full advantage: use your time spent listening, considering and learning to complete your task efficiently and effectively. When speaking up is not your forte, embrace the chance to let your work speak for itself. This article was first published by The Globe and Mail. In a span of 10 days in mid-October, my colleague and I traveled over 6,600 miles to attend the International Practice Management Association (IPMA) and National Federation Paralegal Association (NFPA) conferences held in Orlando, Florida and Seattle, Washington. This was an opportunity to reconnect with old friends and make new acquaintances. The new relationships would primarily be for business purposes but could quite possibly turn into long-lasting friendships. What are the benefits of actively networking? Networking can help you develop and improve your skill set, stay on top of the latest trends in your industry, keep a pulse on the job market, meet prospective mentors, partners, and clients, and gain access to the necessary resources that will foster your career development. According to a survey conducted by LinkedIn in 2017, almost 80 percent of professionals consider networking to be important to career success. Even more interesting was that according to that same survey nearly 70 percent of the people in 2016 were hired at a company where they had a connection. Today there are so many ways to network. While there are hundreds of social media outlets (LinkedIn being the most popular) to connect with, in my opinion, there can be nothing more invigorating than spending time around people who are supportive and share a common interest. Whether it is in the office where you work or the person you meet at the grocery store, there is always an opportunity to network. Start by looking for a local group of professionals in your field who meet on a regular basis and provide opportunities for career advancement, training, and networking. The elements of networking were on full display at both conferences. I encountered opportunities to learn through targeted seminars presented by experts in their respective fields. I observed meetings/debates regarding specific challenges that affect the workplace and advice on career advancement. I also saw colleagues from across the country celebrate the impressive achievements of their counterparts. Despite traveling from coast to coast a few days apart, my colleague and I agree that we feel exhausted yet exhilarated for the opportunity to meet with such a diverse and passionate group of professionals who care deeply about what they do for a living. Being a paralegal myself I can certainly appreciate the commitment. Do you have a networking story you’d like to share? Feel free to drop a comment on our LinkedIn page. You never know who it may benefit. While you’re at it, come join our LinkedIn group (United Corporate Services, Inc.) to receive more blogs like this one and to share your journey. We’d love to network with you! You don't need to block out 30 minutes to practice meditation in order to experience the benefits of mindfulness at work. Here are a few ways you can stay in the present moment to do your best during a busy day. Mindfulness may seem like a great idea, but how do you become more mindful in the context of a busy work day? You may have emails, phone calls, meetings, and presentations to deal with. And, of course, your own work! In the middle of all that, how can you apply the principles of mindfulness so that you feel more alive and present, as well as being productive? Here are a few popular and other more radical ways to be mindful at work. Mindfulness is, above all, about being aware and awake rather than operating unconsciously. When you’re consciously present at work, you’re aware of two aspects of your moment-to-moment experience—what’s going on around you and what’s going on within you. To be mindful at work means to be consciously present in what you’re doing, while you’re doing it, as well as managing your mental and emotional state. If you’re writing a report, mindfulness requires you to give that your full attention. Each time your mind wanders to things like Helen’s new role or Michael’s argument with the boss, just acknowledge the thoughts and bring your attention back to the task in hand (see how to stop thinking). This scenario sounds simple, but many aspects of your experience can get in the way. Make a clear decision at the start of your workday to be present as best you can. Pause for a few moments before you start your work day to set this intention in your mind. Mindful exercises train your brain to be more mindful. The more mindful exercises you do, the easier your brain finds it to drop into a mindful state, thus optimizing your brain function. In the busy workplace, finding time for a 30-minute mindful exercise can be difficult. So does that mean you can’t be mindful at all at work? Nope. Mindful exercises can be as short as you wish. Even one minute of consciously connecting with one of your senses can be classified as a mindful exercise. You don’t need to close your eyes. You don’t even need to be sitting down. Be creative about finding slots in the day to practice mindfulness exercises. At times of excessive pressure at work, practicing a short mindfulness exercise can be a saviour. The process helps to rebalance your nervous system, toning down the fight-or-flight response and engaging the wise part of your brain, so that you make reasoned decisions rather than automatically react to situations. Single-tasking is doing one thing at a time. Multi-tasking is trying to do two or more tasks at the same time or switching back and forth between tasks. Nobody can actually multi-task. In reality, your brain is madly switching from one thing to the next, often losing data in the process. 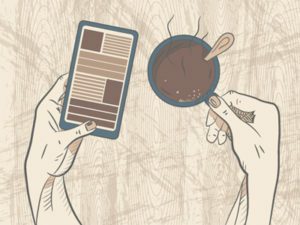 Most people know multitasking is ineffective nowadays. If multi-tasking is so inefficient, why do people still do it? The reason was uncovered in a study by Zheng Wang at Ohio State University. She tracked students and found that when they multi-tasked, it made them feel more productive, even though in reality they were being unproductive. Other studies found that the more you multitask, the more addicted you get to it. Keep a time journal of what you achieve in a block of time. Work out when you’re single-tasking and when you’re multi-tasking. Note down what you achieved in that time block and how mindful you were. The word “mindful” means to remember. Most people who’ve read about or undertaken training in mindfulness appreciate the benefits of mindful living. Unfortunately, they keep forgetting to be mindful! The reason you forget to be mindful is because your brain’s normal (default) mode is to be habitually lost in your own thoughts—running a sort of internal narrative. When you’re going about your usual daily activities, your brain switches you into this low energy state, which is unmindful, almost dreamy. Doing some things automatically, without thinking, is fine but research undertaken at Harvard University showed that 47 per cent of a person’s day can be spent lost in thoughts. The same research found that day dreaming can have a negative impact on well-being. Being on auto-pilot means that you’re not fully present and awake to the opportunities and choices around you. You can’t be creative, plan something new or respond appropriately if you’re operating mechanically. Setting an alarm on the phone – even a vibrating alarm that doesn’t disturb others can work well. So, every time your phone rings, you take a mindful breath. Every time you hear the ping of a text message, you pause to be mindful of your surroundings rather than immediately reacting by checking the message. All these things are opportunities to come back into the present moment, to see yourself and your surroundings afresh. You take a small step back and reflect rather than automatically react to what’s coming at you in the form of demands, tasks, and challenges. Mindfulness at work does seem counter-intuitive. You’re considering the fact that, by stopping or slowing down, you can become more efficient, productive, happy, resilient and healthy at work. You may not think that slowing down and being conscious can have such an effect (see How to Stop for more tips on that). Imagine being asked to stop sleeping for a week. Sleeping is resting—and resting isn’t work. So, simply stop sleeping and just keep working. Maybe you’ve experienced this when studying for exams or trying to meet a deadline at work. Eventually your efficiency drops to almost zero; you’re completely living out of the present moment and perhaps even hallucinating! You need to sleep at least seven hours every night to be able to function effectively. Clearly, rest can increase efficiency. If you do manage to get about seven hours of sleep and achieve a certain amount of work, imagine what would happen if you also did a few mini-mindfulness exercises during the day? Your brain would become even more efficient, focused, effective at communicating with others, and better at learning new skills. Being in a panicky rush leads to bad decisions and is a misuse of energy. Instead, pause, focus on listening, stroll rather than run, and generally take your time when at work. Effective leaders, workers, and entrepreneurs slow down and reflect to make the best decisions and actions—they slow down to speed up. That’s a mindful way of working. Recent research conducted at the University of Wisconsin-Madison, asked 30,000 people the same question: “Does the perception that stress affects health matter?” The results were astonishing. The researchers found that people experiencing high levels of stress but who believed that stress was good for them had among the lowest mortality rates. Whereas highly stressed people who believed that stress was bad for their health had the highest chance of dying. Your beliefs about stress clearly affect how they impact on your health and well-being. Another study even found that the blood vessels constricted (as is seen in those with heart disease) in people who believed that stress was bad for them, but stayed open and healthy in those who believed that stress was good for them. If reading this didn’t make you go “wow,” try reading it again. It’s the most exciting research I’ve read this year! So if you want to make stress your friend, you need to change the way you think about it and, in turn, your body’s response to it. Mindfulness can help you achieve this change in perception. The next time you’re facing a challenge at work, notice how your heart rate speeds up and your breathing accelerates. Observe these responses and then switch your attitude—respond to your stress creatively rather than negatively. Be grateful that the stress response is energizing you. Note that your body is preparing you for your upcoming challenge and that a faster heart rate is sending more oxygen around your body. Be grateful that the process is sharpening your senses and boosting your immune system. By viewing the stress response from this perspective, you see your upcoming problem as a positive challenge and recognize your body preparing to meet it. This small change in attitude can literally add years to your life and improve your productivity and achievements in the workplace. Humans have a “negativity bias.” Essentially, this means that you’re much more likely to focus and dwell on something that’s gone wrong than on things that have gone well. Behaving in this way every day means that you ultimately adopt an excessively negative and unbalanced way of thinking. Gratitude is the antidote. Plenty of evidence suggests that actively practicing gratitude makes you feel better and has a positive impact on your creativity, health, working relationships, and quality of work. Gratitude makes being at both work and home more positive experiences. If you feel like you’re stuck in a job you don’t enjoy, the first step is to practice gratitude. What’s going well in your job? Maybe you’re grateful for the money? Even though it may be less than you’d like, you probably prefer it to having no salary at all. You may not like your manager, but maybe you’re friends with a couple of colleagues? You hate the office politics, but they give you insight into what you don’t like in a job, so in the future you know what to look for. After practicing gratitude, you can then consider whether you want to continue in that role or need to find another job. Being mindful of what’s going well at work helps to improve your resilience. Rather than allowing your mind to spiral into anxiety or dip into low moods as you brood over all the aspects of the job you don’t like, you can feed your mind with thoughts of gratitude to raise your well-being. Then, if you do decide to find another job, your positive mental state can help you select an appropriate position and optimize your performance in the interview. People hire positive people, not those who just complain about what’s going wrong. Use gratitude to neutralize your brain’s natural negativity bias. Humility comes from the Latin humilis, meaning grounded. Humble people have a quiet confidence about themselves and don’t feel the need to continuously remind others of their achievements. Humility may seem counter to our culture of glorifying those who make the most noise about themselves, grabbing our attention. But actually, humility is attractive—no one enjoys being around those who continually sing their own praises, and most people enjoy the company of those who are willing to listen to them rather than talk about themselves all the time. In Jim Collin’s hugely popular book Good to Great, he identified leaders who turned good companies into great ones. He found that the companies exhibiting the greatest long-term success (at least 15 years of exceptional growth) had leaders demonstrating all the skills of your standard leader but with one extra quality—personal humility. They were willing to work hard, but not for themselves—or the company. If things went wrong, they didn’t seek to blame other to protect themselves. And if things went well, they immediately looked outside of themselves to congratulate others. They didn’t have an inflated ego that needed protecting all the time. Humility is often confused with meekness or timidity but they’re not the same. Humility does not mean seeing yourself as inferior; rather, it means being aware of your natural dependence on and equity with those around you. How is humility linked to mindfulness? Mindfulness is about accepting yourself just as you are, and being open to listening to and learning from others. Mindfulness is also synonymous with gratitude—you appreciate how others have helped you. And someone who is grateful for the contribution of others is naturally humble. Undertake mindful exercises: Mindfulness reduces activity in the part of the brain that generates the story of your self—sometimes called the narrative self. Giving too much attention to you and your own story is unhealthy. Mindfulness practice helps you to be more connected with your senses—the present self. Your attention widens and you can see how much others contribute to your everyday successes. Acceptance lies at the heart of mindfulness. To be mindful means to accept this present moment just as it is. And it means to accept yourself, just as you are now. It doesn’t mean resignation or giving up. But it does mean acknowledging the truth of how things are at this time before trying to change anything. Here’s a workplace example. If you went $30,000 over budget, that’s a fact. It’s already happened. As soon as you accept that, you can move forward and try to deal with the situation. Lack of acceptance can lead to denial of the fact (maybe causing you to go even more over budget) or avoidance (you keep skipping meetings with your boss) or aggression (you vent your anger at your team unnecessarily, adversely affecting relationships and motivation). Instead, you can accept the situation, talk to the necessary people, learn from your mistakes, and move on. Acceptance actually leads to change. When you accept yourself, you cut down on energy-draining self-criticism. You’re then much better able to enjoy your successes and smile at your shortcomings. Personal acceptance is even more powerful. Self-acceptance is embracing all facets of yourself—your weaknesses, shortcomings, aspects you don’t like and those you admire. When you accept yourself, you cut down on energy-draining self-criticism. You’re then much better able to enjoy your successes and smile at your shortcomings. Through self-acceptance, you can create a clarity of mind that allows you to work on those aspects of yourself you wish to improve. The starting point of self-improvement and personal development is self-acceptance. According to Carol Dweck and her team at Stanford University researcher, people essentially adhere to one of two mindsets—a growth or a fixed mindset. People with a fixed mindset believe that their basic qualities, such as their intelligence and talents, are fixed traits. Instead of developing their intelligence and talents, they spend their time hoping their traits will lead to success. They don’t seek to develop themselves, because they think that talent alone leads to success. They turn out to be wrong—brain science has proved otherwise. People with a growth mindset believe that they can improve their intelligence and talents with effort. By applying themselves, they think that they can get better. They see brains and talent as just the starting point, and build on them with hard work and determination. Brain scans have actually revealed that effort does lead to growth in intelligence and enhancement of initial talent over time. People with this mindset have a love of learning and demonstrate greater resilience. Success at work depends on having a growth mindset. Mindfulness is about adopting a growth mindset. Mindfulness is about giving attention to the present moment and not judging your innate talent or intelligence, but being open to new possibilities. When you adopt a growth mindset at work, you don’t mind getting negative feedback as you view it as a chance to discover something new. You don’t mind taking on new responsibilities because you’re curious about how you’ll cope. You expect and move towards challenges, seeing them as opportunities for inner growth. That’s the essence of mindfulness at work—believing that you can improve and grow with experience, moving towards challenges, living in the moment, and discovering new things about yourself and others. 1. Listen to the voice of a fixed mindset in your head. This is about being mindful of your own thoughts when faced with a challenge. Notice if the thoughts are telling you that you don’t have the talent, the intelligence or if you find yourself reacting with anxiety or anger when someone offers feedback to you. 2. Notice that you have a choice. You can accept those fixed mindset thoughts or question them. Take a few moments to practice a mindful pause. 4. Take action on the growth mindset. This will make you enjoy the challenges in the workplace, seeing them as opportunity to grow rather than avoid. Use the above system if you mind starts leaning towards the fixed mindset. Over time, you’ll find yourself habitually of a growth rather than fixed mindset, leading to greater success and personal mastery that before. This article was adapted from Mindfulness at Work for Dummies by Shamash Alidina and Juliet Adams. Add more specific details, cut out your address, tie unrelated experience to your field, and enough with the italics. Twenty five years ago marked the beginning of my legal career, at a time when the world was a very different place. The year was 1990, Wilson Goode was the mayor of Philadelphia, the phrase "Google it!" didn't exist, Congress voted for the Americans with Disabilities Act, and President George H.W. Bush and Soviet leader Mikhail Gorbachev signed an historic agreement to end production of chemical weapons. I had no idea what a professional paralegal association was or why networking with other paralegal professionals was an important part of my occupation. As I built my career, I quickly found value in the opportunities and benefits that membership in a professional paralegal association provided. One of the first steps toward furthering your paralegal career should be exploring the idea of joining a professional paralegal association. You might ask yourself, "How will becoming part of this group help further my paralegal career?" Joining a professional paralegal association may not be one of your top priorities. What paralegal has time for more meetings and activities after working all day with deadlines, charts, and other daily tasks? The answer is that you should make the time; an association is synergistic with your growth. As Thomas Jefferson once said, "Do you want to know who you are? Don't ask. Act! Action will delineate and define you." My membership in a professional paralegal association provides me with valuable networking benefits that include, but are not limited to, meeting and interacting with professional contacts, access to a wealth of useful practice information, continuing legal education through conferences and seminars, becoming an advocate of my career, and the opportunity to mentor others. Associations sponsor countless events throughout the year that allow you to connect with your colleagues in the paralegal profession. Building such relationships is a fundamental way to establish and ensure that you are working diligently on your career path and consistently improving your skill sets. By attending various association events, you have the chance to socialize with other paralegal colleagues and paralegal students while extending your professional networking opportunities. It's not every day that you have a chance to meet the chancellor of the Philadelphia Bar Association, or federal, state, or local judges, or some of the prominent members in the legal community and hear them speak on legal issues. Your connections will extend beyond just your firm, but also with paralegals in different capacities such as in-house, government, and nonprofit paralegals. By becoming an involved and active committee member or even chair, you will become a highly valued member in your association. The connections you establish will be invaluable resources in your career. The more people you know, the more people know you, and the more you can learn from them. As Henry Ford said, "Coming together is a beginning. Keeping together is progress. Working together is success." The paralegal profession is an ­ever-evolving practice that requires continued learning and expansion of skills. Every paralegal job has become more sophisticated as new technology continues to be ­introduced. Paralegals need to develop a culture of learning not only in learning the use of emerging technology, but the importance of improving the efficiency of their current legal technology skills. Associations offer several ways to broaden this knowledge. Opportunities include case studies, online courses, career guides, articles and books written by experts in your area of practice, educational conferences and seminars for association members to attend, and free subscriptions to industry magazines, print and online publications, and other informative resources. Another important benefit to membership in a professional paralegal association is the career resources offered to members. Many associations offer job listings online that are only available to their members. When looking for job opportunities, your connections with fellow paralegals can offer insights and perspective on a firm's culture and leadership. They may also know of new vacancies being offered even before the job posting appears on social media or in other publications. For recent ­paralegal program graduates, establishing relationships with alumni associations also will help you professionally and socially. This is especially true for job offerings from various organizations seeking entry level and experienced paralegals. Furthermore, such associations offer tips on resumes and the drafting of cover letters, strategies on job searching and techniques relating to negotiations. Associations provide new paralegals with a chance to market themselves, gain career advice, meet potential mentors, make commitments, update knowledge, and take part in association activities. There are a variety of volunteering opportunities for new members of an association to get more involved. You don't want to miss out on the ­numerous membership benefits that a professional association offers. Ronald Reagan made a statement that "There are no great limits to growth because there are no limits of human intelligence, imagination and wonder." Mentoring is the pillar of many professional associations when working with newer members. There is a noticeable difference in paralegals who had a mentor at the beginning of their career. Mentorship does not take much time. A short discussion over coffee or lunch, even a few emails will be suitable. Mentors who share their knowledge, experiences, and connections with newer members of the association will create a sense of appreciation, respect, and pride among colleagues. Giving back can be the greatest reward and benefit. Many mentees are looking to learn from experienced mentors. Mentees need to take an active role, be open, willing to work and be respectful of a mentor's busy schedule. Many mentoring relationships turn into lifelong friendships. My first mentor was my boss when I was working as a library clerk 25 years ago. My second mentor was an attorney that I had a privilege to work with and witness him grow professionally from a summer associate to a firm partner. I have built not just a professional relationship with my mentors but a personal one as well. As Steven Spielberg once said, "The delicate balance of ­mentoring someone is not creating them in your own image, but giving them the ­opportunity to create themselves." Victor F. Panieczko is a paralegal with Rawle & Henderson. He is currently serving as a first vice president of The Philadelphia Association of Paralegals and chair of its technology and litigation committees. He can be contacted at 215-575-4351 or vpanieczko@rawle.com.